Improve buyer reviews and referral rates with better communication during construction. Builder Signal is the easiest way to send construction updates to your customers. Simplify the process of sending construction updates. Signal is built from the ground up for ease of use in the field. 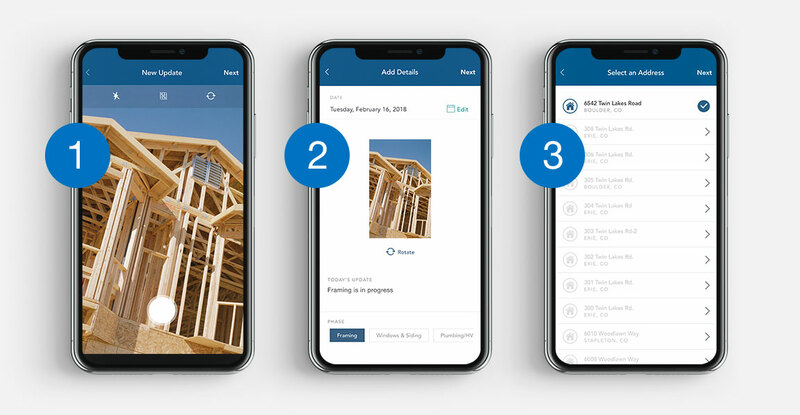 The streamlined app makes posting construction photos a breeze. No more digging for buyer contact details, no more email attachments, just quick and easy updates that delight buyers. Give your buyers peace-of-mind for their home. Current "homeowner portals" built into scheduling software are too time-consuming, and rarely kept up-to-date. Buyers don’t want an abundance of inaccurate information. They want simple, timely updates that give them peace-of-mind. Just take a picture, select the construction phase, and select the home. Your customer will automatically get a notification & link to their home’s website with a visual timeline. Sending construction updates has never been easier. Director of Sales, Regional Construction Co. Contact us to learn how Signal can improve homeowner satisfaction for you. Contact us with questions regarding support for Builder Signal. Copyright © 2019 The Bokka Group. All Rights Reserved.